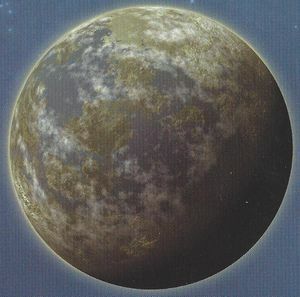 Eayn is the primary natural satellite orbiting Chu'ot, the third planet in the Y'Deio system, as well as the homeworld of the Kig-Yar. The moon lies on the inner region of the Y'Deio system's expansive asteroid belt, with many Kig-Yar choosing to live on the planetoids, moons, and asteroids within the asteroid belt. Although Eayn is their homeworld, few Kig-Yar place any importance on that fact, with only a third of the Kig-Yar in the Y'Deio system residing on Eayn. Eayn keeps few ties with the more remote, independent colonies. Long before the Kig-Yar achieved space flight, Eayn experienced an era defined by gladiatorial combat. The ancient Kig-Yar alive at this time would hold inter-clan physical combat competitions in the largest population centers on Eayn's supercontinents. The ancient Kig-Yar sailed the waters of Eayn and raided competing clans for food and mates. However, as their populations grew, the differences and distances between Eayn's clans decreased and a new cooperative spirit led to the invention of spacecraft allowing them to colonize nearby worlds. Eayn's dominating governments pushed many Kig-Yar to colonize the asteroids and moons of the nearby asteroid belt. When small contingent fleets of the Covenant arrived in the Y'Deio system in 1342, the pirates, mercenaries, and militias of the Kig-Yar joined forces in an attempt to fend off the alien intruders. The Kig-Yar met the Covenant headlong in battle, beginning a protracted naval campaign. Despite the ruthlessness of their fleets, the Kig-Yar were able to resist the Covenant for a time, they eventually submitted to the empire's might, choosing to profit from the immediate expansion of trade and wealth that the Covenant could provide. However, Eayn was never fully integrated into the Covenant and endless cycles of unification and civil war continued. After the Covenant fell in 2552, an uneasy peace on Eayn prevailed under an alliance of arch-matriarchs. Eayn's native population continued to grow within reasonable governable parameters, and its economy and society stabilized in wake of the Human-Covenant War. With trading fleets and pirate flotillas under their control, the arch-matriarchs of Eayn seek increased influence and wealth through trade and the careful application of violence. Eayn is characterized by a single equatorial ocean, sparse volcanic activity, and an almost total lack of glacification. The watery world features tropical archipelagos, with two supercontinents dominating Eayn's landmass, Ah'lomet and Ruuht. Smaller islands lay in between the two continents. Ibie'sh is a volcanic island-continent somewhat isolated from the other two. The moon is home to a tropical environment, with a theorized history of widely varied environmental conditions. Eayn's gravity is about 0.875 G's, making its inhabitants more lightly built than on Earth. Eayn's atmosphere is rather similar to that of Earth, being composed of oxygen, nitrogen and carbon dioxide. Its surface temperatures range from -18°C to 45°C (-0.4°F to 113°F). Always a world of conspiracy and violence, Eayn is ruled by an alliance of arch-matriarchs, queens that form the bulk of Kig-Yar royalty. With a postindustrial capitalist society, the governments of Eayn have been described as oligarchies, with luck egalitarianism forming the base of the justice system. While under the governance of the Covenant, Eayn was never fully integrated under the empire's rule. Even after the collapse of the Covenant, Eayn's matriarchal government continues to thrive. The continents of Ah'lomet and Ruuht are ruled by separate pseudo-governments that contest nearby islands. With the Kig-Yar social structure having its roots from an early form of despotic matriarchy, the governments that once ruled Eayn were oppressive, leading to Kig-Yar to form colonies with sectarian societies in the asteroids near Chu'ot. The global government on Eayn would later spread power more widely, though females remained at the top of the power structure, controlling breeding rights, territory, familial organization, and major assets. Eayn is a fictional satellite of a real extrasolar planet (HD 69830 d), which was discovered in May of 2006.